Housing Perspectives (from the Harvard Joint Center for Housing Studies): It’s Not Just the Economy, Stupid! Just as James Carville reminded Governor Bill Clinton and his staff to stay focused in his campaign for the Presidency with his now-famous 1992 posting of the words “The Economy, Stupid” on the wall of Clinton’s Little Rock headquarters, it is sometimes the title of this blog post that I need to be reminded of when dissecting household trends impacted by the Great Recession. Aside from the economic, other longer-term demographic trends, such as in the race/Hispanic origin composition of the population, or in life-course transitions of young adults (such as age at marriage, childbearing patterns, and labor force participation), often play a significant role. Sometimes, short-term trends that are hard-wired into the time frame under consideration, such as the changing age composition of the population, also need to be considered. These demographic trends do not necessarily trump the economic, but they must be considered. 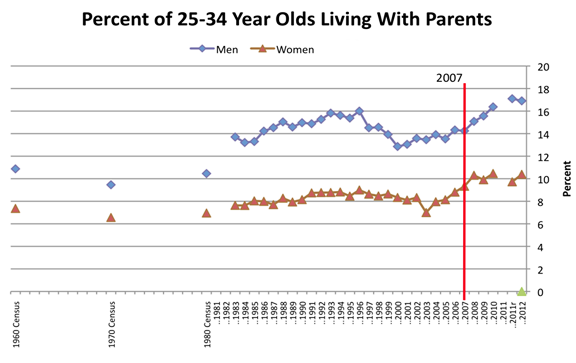 A case in point is the trend in the number and share of young adults who are still living with their parents. While there has been much discussion of the effects of the poor economy on preventing young adults from leaving the parental nest and forming independent households, Figure 1 shows that this trend predates the Great Recession that began in December 2007. Among men, there does appear to be a slight acceleration of the trend since 2007, at least until this past year. But for women, the upward trend that started in 2004 flattens out starting in 2008, early in the Recession. It has been argued that perhaps this is simply evidence that the Great Recession primarily affected men’s employment and income because of the big decline in construction and manufacturing jobs. However, no one argues that the increase in men living at home that started in the early 2000s was due to the 2 million increase in construction jobs that took place between 2000 and 2007. 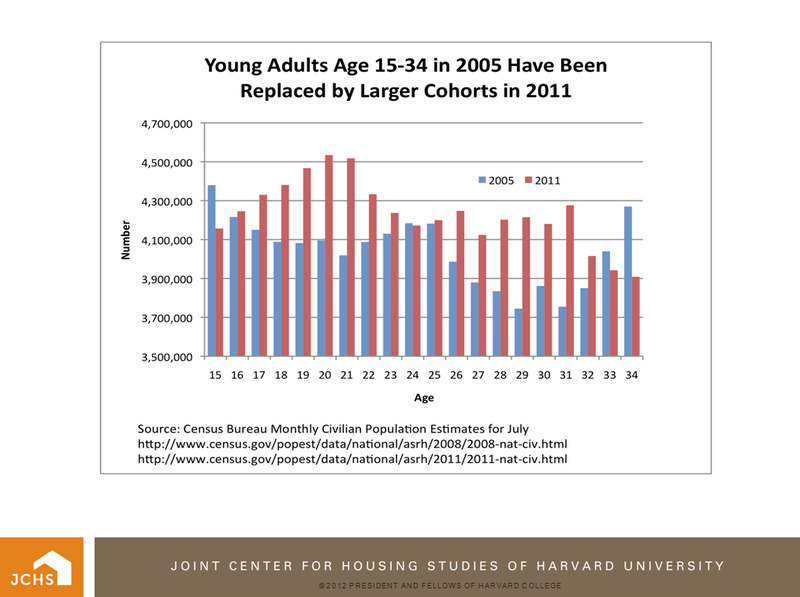 That delay in nest-leaving is usually explained by the greater representation of Hispanics and Asians in the young adult population (who tend to live with parents longer), or to the need for men (and women) to stay in school longer to qualify for the jobs that are being created by the post-industrial economy, or to the slower pace that today’s young adults approach marriage and family formation. But these influences continued to operate after 2007 as well, and have likely not run their course. Another factor to consider when explaining post-2007 trend is the increase in the number of young adults turning age 25 starting in 2005. Figure 2 plots the growth of the number of persons in the civilian population between the ages of 15 and 34, by single years of age, between 2005 and 2011. 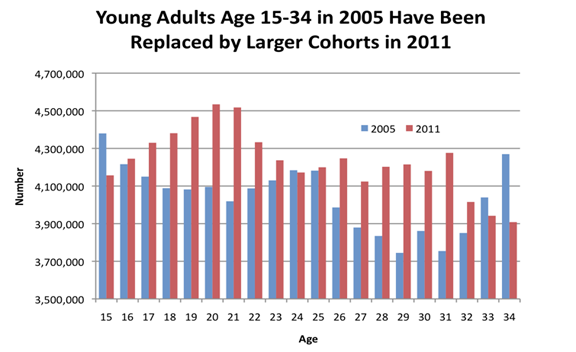 The increase in the number of 26-31 year olds over the past six years is clearly evident. These persons were 20-25 year olds in 2005 and were part of the growing birth cohorts from the tail end of the Baby Bust that were further inflated by under 25 year old immigrants who arrived between 1995 and 2005. As more persons crossed the 25 age threshold at mid-decade, the 25-34 age group became more weighted at the younger ages. 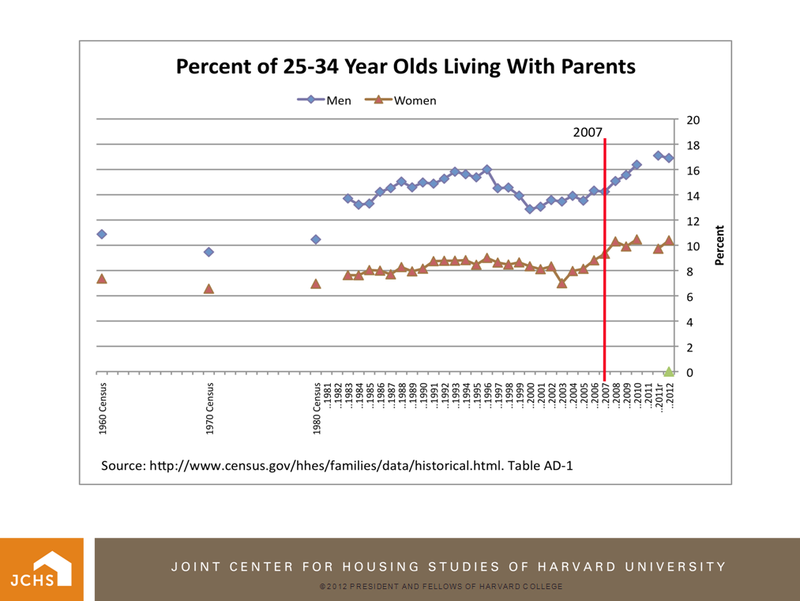 And since 25-29 year olds are ever-more likely to live at home because of the various long-term cohort trends just mentioned, compared to 30-34 year olds who are more likely to have fledged the nest, the overall share of 25-34 year olds still living at home should have accelerated after 2005. Also evident in Figure 2 are the looming echo boom adults under the age of 25 in 2011 who will turn 25 in the near future. These echo boomers, already larger than the cohort they will replace, will be further augmented by immigration over the coming decade. These aging echo boomers will initially further skew the 25-34 age group toward the younger ages, and buoy up the share of 25-34 year olds likely to be living with parents, at least for the next five years, after which the oldest echo boomers will begin to turn 30.